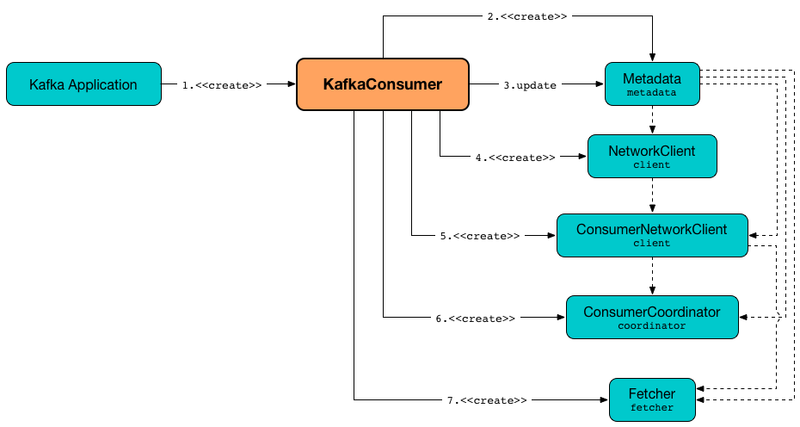 KafkaConsumer is a concrete Kafka client to consume records from Kafka topics for Kafka developers to write Kafka consumers. KafkaConsumer is created with properties and (key and value) deserializers. bootstrap.servers and group.id properties are mandatory. Use ConsumerConfig.BOOTSTRAP_SERVERS_CONFIG and ConsumerConfig.GROUP_ID_CONFIG values in your source code, respectively. Once created, KafkaConsumer is supposed to subscribe to topics or assign partitions. KafkaConsumer is then requested to poll for records (in a loop). KafkaConsumer registers itself in JMX with kafka.consumer prefix. KafkaConsumer is not thread-safe, i.e. you should not use the same single instance of KafkaConsumer from multiple threads. You should use only one thread per KafkaConsumer instance. KafkaConsumer uses light locks protecting itself from multi-threaded access and reports ConcurrentModificationException when it happens. Created right when KafkaConsumer is created. ConsumerInterceptors that holds ConsumerInterceptor instances (defined using interceptor.classes setting). KafkaConsumer reports ConfigException when smaller or equal than session.timeout.ms and fetch.max.wait.ms properties. Enable DEBUG or TRACE logging levels for org.apache.kafka.clients.consumer.KafkaConsumer logger to see what happens inside. assign is part of Consumer Contract to…​FIXME. unsubscribe is part of Consumer Contract to…​FIXME. subscribe subscribes KafkaConsumer to the given topics. subscribe then requests SubscriptionState to subscribe for the topics and listener. In the end, subscribe requests SubscriptionState for groupSubscription that it then passes along to Metadata to set the topics to track. poll is part of the Consumer Contract to poll for ConsumerRecords. poll polls for new records until timeout expires. KafkaConsumer has to be subscribed to topics or assigned partitions before calling poll. Internally, poll simply calls the internal poll method with the Time that expires after the given timeout and the includeMetadataInTimeout flag on. poll requests the ConsumerNetworkClient to maybeTriggerWakeup. commitSync is part of Consumer Contract to…​FIXME. seek is part of Consumer Contract to…​FIXME. Internally, listTopics simply requests Fetcher for metadata for all topics and returns it. listTopics uses requestTimeoutMs that corresponds to request.timeout.ms property. beginningOffsets requests Fetcher for beginningOffsets and returns it. KafkaConsumer initializes the internal registries and counters. KafkaConsumer API offers other constructors that in the end use the public 3-argument constructor that in turn passes the call on to the private internal constructor. When created, KafkaConsumer adds the keyDeserializer and valueDeserializer to configs (as key.deserializer and value.deserializer properties respectively) and creates a ConsumerConfig. KafkaConsumer passes the call on to the internal constructor. KafkaConsumer sets the internal requestTimeoutMs to request.timeout.ms property. KafkaConsumer sets the internal clientId to client.id or generates one with prefix consumer- (starting from 1) if not set. 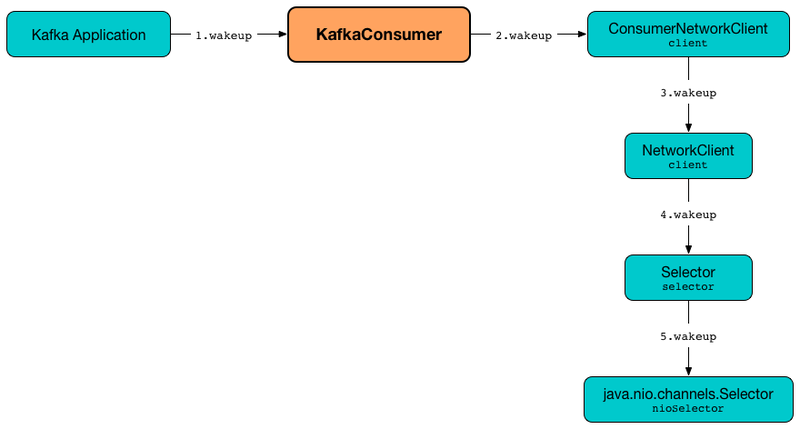 KafkaConsumer sets the internal Metrics (and JmxReporter with kafka.consumer prefix). KafkaConsumer sets the internal retryBackoffMs to retry.backoff.ms property. KafkaConsumer updates metadata with bootstrap.servers. Any issues while creating a KafkaConsumer are reported as KafkaException. wakeup is a part of Consumer Contract. wakeup simply requests ConsumerNetworkClient to wakeup. Quoting wakeup of Java’s java.nio.channels.Selector given wakeup simply passes through the intermediaries and in the end triggers it. Read about Selection in java.nio.channels.Selector&apos;s javadoc. configureClusterResourceListeners creates a ClusterResourceListeners and registers ClusterResourceListener instances from the input candidateLists, keyDeserializer and valueDeserializer. throwIfNoAssignorsConfigured is used exclusively when KafkaConsumer is requested to subscribe to topics. updateAssignmentMetadataIfNeeded requests the ConsumerCoordinator to poll until the Timer expires. If the poll was successful, updateAssignmentMetadataIfNeeded updateFetchPositions. updateAssignmentMetadataIfNeeded is used exclusively when KafkaConsumer is requested to poll for records. pollForFetches is used exclusively when KafkaConsumer is requested to poll for records. commitAsync is part of the Consumer Contract to…​FIXME. committed is part of the Consumer Contract to…​FIXME. close is part of the Consumer Contract to…​FIXME.